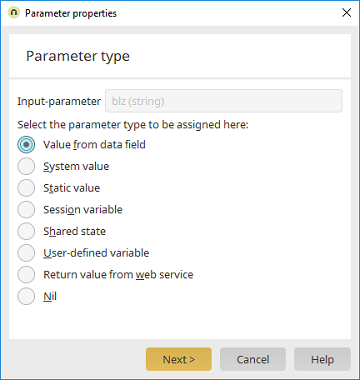 For all parameter types, the currently selected operation is entered automatically. In the subsequent dialog, a data field can be selected that provides the current value for the input. With this option, a system value that should be sent to the web service as an input can be defined in the subsequent dialog. With this parameter type, a fixed character string can be defined in the subsequent dialog that will be sent to the web service. The current value of a session variable can also be set as an input. The variable can be defined in the subsequent dialog. When a user visits the current page in the browser, their browser receives a session cookie from the web server for the duration of their visit; this is saved in the temporary files of the browser. A cookie contains text information consisting of the cookie name and value. An individual session object is saved on the web server for each visitor for this session cookie. The session cookie saves every session variable that can be set and read by the page during the visit. With this parameter type, a variable can be defined for the processing context in the subsequent dialog. With this parameter type, a custom variable can be defined in the subsequent dialog, which can be written to and read from. If multiple web service request are peformed after each other, subsequent requests can use or overwrite the values from previous requests. The values are only valid within the web service request chain. In this characteristic, a user-defined value differs from a session variable. This parameter type uses the return value of a web service request as an input. The value can be defined in the subsequent dialog. Nothing will be assigned with this parameter type. The ability to make an explicit assignment of nil can be useful in certain cases in order to eliminate ambiguities in the assignment at runtime, which would otherwise lead to errors.